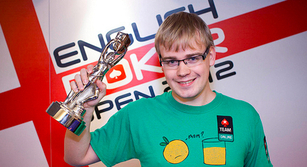 Mickey Petersen from Denmark has won the English Poker Open at the Fox Poker Club, London. Last held in 2010 the tournament saw numbers fall from 193 to 137 and the buy in drop from £3,500 to £2,180. Subsequently the top prize of £78,660 was well down on the £220,650 won by Fabian Quoss two years ago. Petersen, who won the European Poker Tour Denmark main event earlier this year, had to battle past a significant challenge from some of poker’s old guard including Surindar Sunar who finished third and Chris Bjorin who he eventually vanquished heads up. Petersen took a 4.5 to 1 leads into the dual and while Bjorin doubled up on more than one occasion he couldn’t get enough chip traction to thwart the young Dane’s aggressive style. In the Petersen pushed with 9-9 and Bjorin called with A-K and the nines held up.